Having written a book about infidelity, it is amazing how many people have approached me with stories of their own or others close to them. One of the commonalities, amongst all the differences in who, how and where, is that their partners were usually blindsided. Whether it was the husband or the wife who went looking for something outside their marriage, when they announced they were leaving, their partners had no idea it was coming. For anyone who is married or in a serious relationship, this is obviously scary. While we like to think that we know our partners and how everything is rolling, it seems that the people who were on the receiving end also thought this and were wrong. You can never know what chance encounters or events conspire to leave yourself or your partner open to the suggestion of others. Maybe it has something to do with our age, as most people I’m chatting with are around the same age as me, nearing forty with all the kids at school, but a lot of marriages are breaking down. When I ask why, partly for research and mostly because there might be something to learn from it, the reasons seem to be something that is resolvable (he/she never listened to me) or that was present from the beginning of the relationship (I don’t like his friends/family). No one has said because they fell madly in love with someone else, though a someone else is generally there in the background. Given the level of difficulty managing new partners and extra children of blended families, especially around holidays, you’d have to really want out to put yourself through the aggravation and negotiation stretching for years ahead. Which begs the question – was the choice of partner wrong in the beginning or do people change? Or does what we want out of relationships change over time and if your partner doesn’t flow in the same direction is it largely inevitable that you will one day look across the table and feel nothing but the desire to flee? Maybe the couples who stay together are mostly lucky, and any smugness felt at not getting divorced has less to do with any conscious decisions you have made, but that you were fortunate that events outside your control went in your favour. There, but for the grace of God, go all of us. 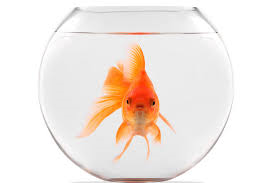 This week I nearly killed the goldfish. His name is Boots, named by a few years ago by a child in the thick of Dora the Explorer fever. Being someone who grew up with a variety of pets, I understand that pet deaths are mostly inevitable, though sometimes due to carelessness. The most striking example of this from my childhood was the short-lived Yabby the yabbie (a small crustacean) who lasted exactly one change of water in the tank. While it was great that my brother was so proactive cleaning it out, he forgot that Yabby was a saltwater creature, not a freshwater one. In case you had any doubt, it matters. So why do I feel particularly guilty about Boots? Well, Boots is a survivor – he outlasted his original companion Dora, who went off exploring into the sky on week one, then Tico and Benny (the golden snails who were supposed to clean the tank) and a much later companion Swiper, who lasted a couple of months. He’s been through so much over the years, and I really sort of bonded with him. He watches me in the kitchen and begs against the side of the tank for me to come and drop the manna from heaven. I don’t really expect the child who “owns” him to actually feed him, so I have really assumed responsibility for it. And I forgot. For I don’t know how many days. He was limply flapping around, barely moving. I thought he was gone. And that was when I realised I couldn’t remember the last time I sprinkled those fishy smelling flakes to his gaping little mouth. This week I’ve been assuaging my guilt by nursing him back to health. Today, he was almost back to his old perky self, flipping his tail around with only a hit of dorsal fin droop. In my guilt spiral, I flirted with releasing him into the wild, where he wouldn’t be adversely affected by an inattentive owner and could seek out his own food. Then I realised what a ridiculous though that was – a goldfish in the wild? Surely it would last mere moments. We keep creatures in our houses that are completely reliant on us, bred to be unable to survive on their own. They are as reliant on us as we are on technology, helpless if it were taken away. Without my phone, computer, tablet or more basically, dishwasher, washing machine, etc I too would struggle. I am Boots.